Let's start by cleaning the clams. unpleasant surprises when it's opening during cooking. soup. Cut the cod in small cubes by removing the bones. Clean the mussels in water and remove his mustache. We start with to fried shallots and fennel dice in oil, medium heat. strongly, add the rest of the fish: cod, mussels and prawns. add the parsley or basil and salt as desired. 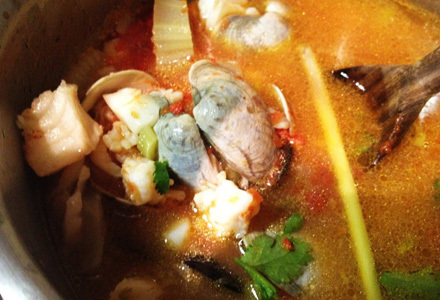 When the mussels will open your soup will be 'ready. A good touch of olive oil and lemon juice before servirla. Iniziamo con la pulizia delle vongole. al momento dell’apertura durante la cottura. Tagliare il merluzzo a cubetti eliminando le spine. 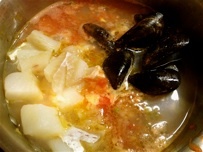 Pulire le cozze in acqua e eliminare il suo baffetto. 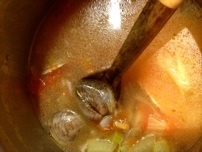 Quando le cozze si apriranno la vostra zuppa sara’ pronta. pane all’aglio o semplicemente del buon riso bianco. Vamos a empezar por la limpieza de las almejas. para dar más "coherencia . Eliminar siempre primero brodetto.